Tridium’s suite of Niagara-based products integrate diverse smart devices into unified, Internet-enabled, web-based systems. These solutions integrate LonWorks™, BACnet™, oBIX, Internet and web services protocols in a software platform that can be used in embedded controllers and server applications. The products include integrated network management tools to support the design, configuration, installation, and maintenance of interoperable networks. 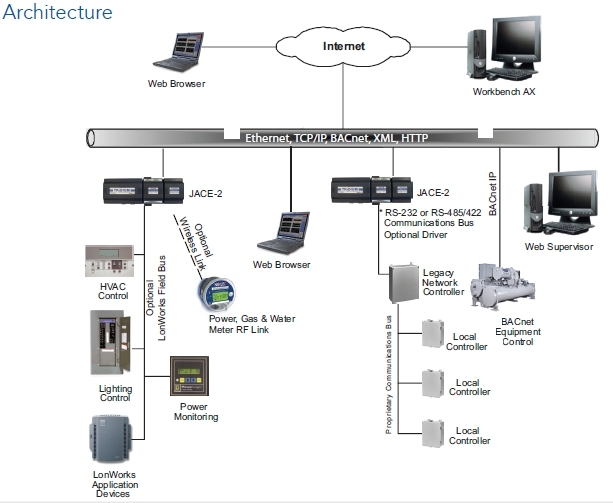 The AX Supervisor is a flexible network server used in applications where multiple NiagaraAX-based JACE® controllers can be networked together. The AX Supervisor serves real-time graphical information to standard web-browser clients and also provides server-level functions such as: centralized data logging, archiving, alarming, trending, master scheduling, system-wide database management, and integration with enterprise software applications. In addition, the AX Supervisor provides a comprehensive, graphical engineering toolset for application development. With NiagaraAX release 3.4 or greater, Tridium offers a platform for the AX Supervisor which runs on Red Hat Linux. NiagaraAX 3.4 and later versions provide AX Supervisor software that is targeted for a specific Linux-based platform: an Intel-based PC platform running the operating system of Red Hat Enterprise Linux 5.
be upgraded to a full AX Supervisor if the job outgrows the limit of three Niagara-based connections. oBIX is now included in all AX Supervisors as a means of integrating Niagara-based Release 2 (R2) JACEs. With release 2.3.522 or greater, the oBIX driver can be added to expose all data points, schedules, trends and alarms to an AX system. This oBIX driver is both a client and a server. A 64-bit compliant version of the AX Supervisor for Windows is available for large systems monitoring in excess of 200 Niagara based controllers. All features of the standard AX Supervisor are included with this platform.